As presented in a previous post, 2.8% of Mexicans (3.3 million) live in severe poverty based on a June 2014 Multidimensional Poverty Index (MPI) developed by the Oxford (University) Poverty & Human Development Initiative (OPHI). The previous post explained the MPI measure of poverty and discussed how Mexico compared to the 108 countries in the study. This post looks into the details of MPI poverty within Mexico. Poverty in Mexico is mostly a rural problem. According to the study, roughly 8.5% of rural residents are severely poor (2.3 million) compared to only 1.1% of people in urban areas (1.0 million). As indicated in the previous post, the MPI is based on ten separate indicators; two for education, two for health and six for standard of living. 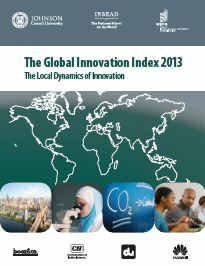 In all cases, people in urban areas scored better on all the indicators than those in rural areas. In rural areas several key MPI indicators contribute the most to poverty: insufficient schooling (19.3%), malnutrition (14.1%), children not attending school (12.9%), use of an unhealthy cooking fuel (12.9%) and unacceptable sanitation (11.7%) . As expected the poorer more rural southern states had the highest MPI poverty levels. Oaxaca had the most living in poverty (11.1%) followed by Guerrero (10.6%) and Chiapas (8.3). Poverty was also high in San Luis Potosí (6.7%), Puebla (5.3%), Veracruz (4.6%), Campeche (4.2%), and Hidalgo (3.4%). These states all have significant indigenous populations. Though the study did not access severe poverty among indigenous groups, available information suggests that those groups suffer by far the highest levels of severe poverty. States with lowest MPI levels are Nuevo León (0.2%), Federal District (0.4%), Baja California (0.4%), Baja California Sur (0.4%), Durango (0.7%), Morelos (1.0%), Colima (1.0%), and Aguascalientes (1.0%); all states with relatively few indigenous inhabitants. Oxford Poverty and Human Development Initiative (OPHI), “Global MPI Data Tables for 2014”, Oxford University, June 2014. Multidimensional Poverty in Mexico: How severe is poverty in Mexico? Updates to Geo-Mexico Comments Off on Multidimensional Poverty in Mexico: How severe is poverty in Mexico? The MPI in the study discussed here is based on a complicated methodology which relies on three different sets of household survey data. Its approach looks at poverty characteristics of household. This is superior to most other poverty measures that look at incomes in comparison to some type of poverty line, which varies widely from country to country. A household may have adequate income, but if that money is spent frivolously on alcohol, drugs, gambling, entertainment, etc., the children in the household might still be living in severe poverty. 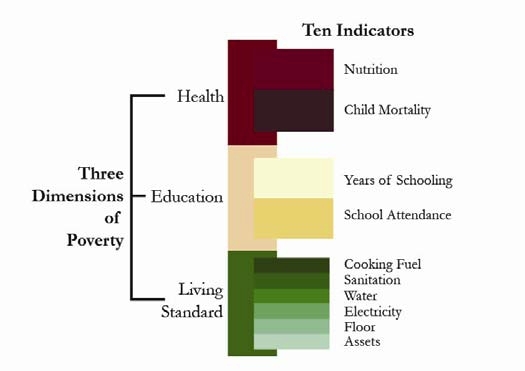 The MPI uses ten indicators (see graphic) representing three equally weighted dimensions of poverty or deprivation within a household: Education, Health and Standard of Living . Education looks at whether any member of the household has at least five years of schooling and if all school –aged children are attending school. Health focuses on whether a child in the family has died and if any adult or child in the household is malnourished. Standard of Living has six indicators for each household: electricity, safe drinking water, proper sanitation, adequate house flooring (not dirt, sand or dung), clean cooking fuel (not wood, charcoal or dung), and ownership of more than one of the following – radio, TV, telephone, bike, motorbike, refrigerator or ownership of a car or truck. Obviously these indicators reveal far more details about poverty than simple income measures. A complicated formula is used to combine these indicators to identify households in severe poverty. A more detailed description of the methodology is provided in this previous post. As noted above, according to MPI, 2.8% of Mexicans or 3.3 million people are severely poor  compared to 32% or 1.6 billion in the 108 countries analyzed which include most of the countries of Latin American, Africa, Asia and Eastern Europe. Of the 108 countries, 29 have smaller percentages living in severe poverty than Mexico. These include Belarus (0.0%), Russia (1.3%), Ecuador (2.2%) and Brazil (2.7%). It is interesting that Ecuador and Brazil have lower MDI levels of poverty than Mexico because both have lower per capita incomes than Mexico and far more income inequality. For example, 0.7% of Mexicans live on under $1.25 a day and 4.5% live on under $2.00 a day, compared to 4.4% and 13.6% for Ecuador and 3.8% and 9.9% for Brazil. Apparently, in Ecuador and Brazil either survival necessities are cheaper or they spend their incomes more wisely or public safety nets are more effective. This suggests that Mexicans could do a better job of combating severe poverty. Countries with slightly worse MPI levels than Mexico are Argentina (3.0%), the Czech Republic (3.1%), Hungary (4.6%), Dominican Republic (4.6%), Colombia (5.4%), Egypt (6.0%) and Turkey (6.6%). That the Czech Republic and Hungary are below Mexico is a bit of a surprise. Further down on the list are China (12.5%), South Africa (13.4%), Peru (19.9%), Indonesia (20.8%), and Guatemala (25.9%). The countries with the severest MPI levels include Pakistan (49.4%), India (53.7%), Nigeria (54.1%), the Democratic Republic of the Congo (73.2%), Ethiopia (88.6%), and lastly Niger (92.4%). According to the study the country with the most people living in severe poverty is India (612 million) followed by China (162m), Bangladesh (83m), Nigeria (82m), Pakistan (81m), Ethiopia (66m), Indonesia (48m), the Democratic Republic of the Congo (44m). 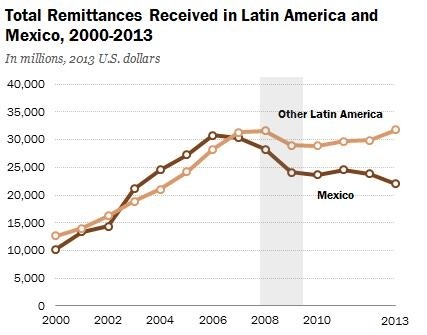 Compared to these countries, the 3.3 million in Mexico seems like a rather small number. Though severe poverty in Mexico is far less than in most other countries, it is still a very serious problem which needs to be addressed. As might be expected, within Mexico severe poverty is worst in rural areas and southern states; we will look more closely at this in a subsequent post. Sabine Alkire and Maria Emma Santos, “Acute Multidimensional Poverty: A new Index for Developing Countries”, Oxford Poverty & Human Development Initiative (OPHI), July 2010, Paper No. 38, . According to the Mexican Government’s Poverty Line, 52% of Mexicans live in poverty. Obviously this is a very different poverty measure than the MPI. A recently released study  indicates that genetic diversity among indigenous Mexicans is far greater than previously thought. Ethnic Seri living in isolated parts of Sonora are as genetically different from isolated Lacandon living near the Guatemala border as Europeans are from Chinese. These differences must have existed for thousands of years before Europeans arrived in the New World. The differences are also reflected in mestizos living in geographically separated parts of Mexico. The study in the June 13 issue of Science was conducted by researchers from the University of California, San Francisco and Stanford. 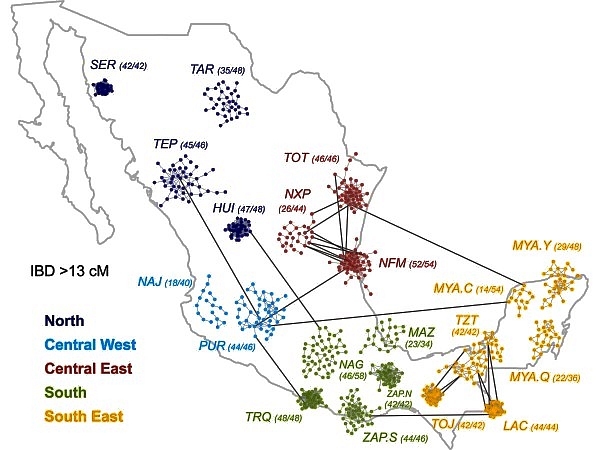 They studied the genomic data from 511 native Mexicans from 20 of Mexico’s 65 indigenous groups scattered throughout Mexico (see map) from the Seri (SER) and Tarahumara (TAR) in the northwest, to the Purépecha (PUR) in the west, Trique (TRQ) and Zapotec (ZAP)in the south as well as three subgroups of Maya (MYA) on the Yucatán Peninsula . They also analyzed similar data from 500 mestizos from ten Mexican states as well as some from Guadalajara and Los Angeles. The findings have great implications for the study of diseases in these populations . For example a lung capacity test can indicate a disease in one indigenous group while the same test results would be normal in a different indigenous group. Moreno-Estrada et al. “The genetics of Mexico recapitulates Native American substructure and affects biomedical traits”, Science 13 June 2014; Vol 344 no.6189, p. 1301. Lizzie Wade. “People from Mexico show stunning amount of genetic diversity”, ScienceMag.org, June 12, 2014. Karen Weintaub,”Mexico’s Natives didn’t mix much, new study shows”, National Geographic, June 12, 2014. The Pew Research Global Attitudes Project (released 24 October 2013) provides results of face to face interviews with a national sample of 1,000 adult Mexicans. The report revealed opinions concerning a wide variety of issues including the country’s direction, most important concerns, law and order, drug war, national institutions and attitudes toward the USA. Mexicans are generally dissatisfied with their country. In March 2013, 69% of Mexicans said they were dissatisfied, up from 63% in 2012, but down from 79% in 2010. The survey suggests that crime is a major cause for dissatisfaction. The biggest concern identified in the survey is crime which 81% said was a very big problem, up from 73% in 2012. Several other crime-related issues topped the very big problem list: cartel-related violence (71%), illegal drugs (70%), human rights violations by the military and police (70%) and corrupt political leaders (69%). The concern for crime causes real fear. The survey noted that 63% say they are afraid to walk alone at night within one kilometer of their home, up 7% from 2012 and 13% from 2007. Women were only slightly more concerned about their safety than men (65% versus 60%). Those in urban areas were significantly more worried about safety than those in rural areas (70% versus 43%). On the other hand, the fact that over four in ten in rural areas were worried is both surprising and startling. Unfortunately, we do not have a complete regional breakdown of the survey respondents. We speculate that crime is perceived as a bigger problem in high crime areas such as the north. Attitudes toward bribery appear to support this view. While 32% said they had to pay a bribe to a government official in the past year; the percentages ranged from 51% in the north to 18% in the Mexico City Region. Over two-thirds (68%) felt that government should focus on maintaining law and order rather than protecting human rights (18%). Only 11% said that both were equally important. It is interesting that respondents from all three major political parties gave almost equal high priority to law and order: Party of the Democratic Revolution (PDR) – 66%; National Action Party (PAN) – 69% and Institutional Revolutionary Party (PRI) – 70%. The drug war continues to be a problem; only 37% think the government is making progress, compared to 47% in 2012. Fully 29% said the government is losing ground in the drug war and 30% think it is about the same as it has been in the past. Over half (56%) blame both Mexico and the USA for drug violence. Only 20% blame just the USA, while 17% blame just Mexico. The vast majority (85%) want the Mexican army to fight drug cartels and over half (55%) would like the US government to provide weapons and training to fight the drug war. Only 34% would like to have US troops in Mexico fighting the cartels. Given that the drug war is not going well and the military is implicated in many human rights violations, it is surprising that 72% of survey respondents feel that the military has a good influence on Mexico. This was higher than any other institution. About 68% felt the national government has a good influence. Other institutions got lower scores: the media – 66%, President Peña Nieto – 57%, Congress – 45%, court system – 44%, and police – 42%. Aside from crime and related issues, Mexicans identified several other major problems. About five in eight (63%) considered poor quality schools a very big problem, way up from 49% in 2012. This increase was probably related to the arrest of the teachers’ union president and focus on the dire need for education reform. Other very big problems were pollution (60%), terrorism (59%) and people leaving Mexico for jobs (53%). This last item is a bit surprising since in recent years (since the Great Recession) relatively few Mexicans have left in search of jobs. The percentage viewing the USA favorably has changed considerably in recent years. In early 2010, before passage of Arizona’s restrictive immigration law, 66% viewed the USA favorably. After passage of the law, this dropped to 44%, compared to an unfavorable view of 48%, up from 27% before the law. Clearly passage of that law had a very big impact on Mexicans. However the favorable ratings increased to 52% in 2011, 56% in 2012 and 66% in 2013. Meanwhile the unfavorable ratings dropped to 41% in 2011, 34% in 2012 and 30% in 2013. Only 17% said they had traveled to the USA, but 21% indicated their families received money from relatives north of the border. About 47% indicated that moving to the USA leads to a better life, while 18% say it leads to a worse life. However, 44% say having citizens living in the USA is bad for Mexico, an equal number say it is good for Mexico. Apparently, the view is that it is good for individuals to move to the USA, but such moves may not necessarily be good for Mexico as a whole. Consistent with this, 35% said they would move to the USA if they had the means and opportunity, 20% would migrate without authorization while 15% would only migrate if they had authorization. It will be interesting to see how these opinions change when the 2014 survey is conducted. San Miguel de Allende: the “world’s best city”? 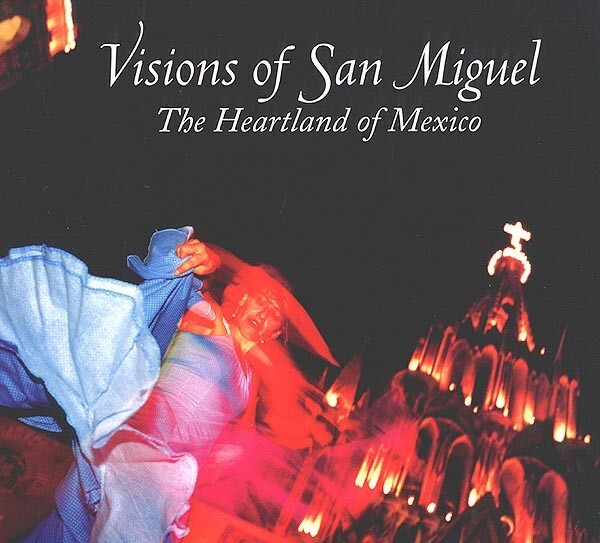 Mexico's geography in the Press Comments Off on San Miguel de Allende: the “world’s best city”? While being declared “the world’s best city” is an honor for San Miguel, and will no doubt increase tourism, it should be noted that it is merely a popularity contest among people visiting a website. Visitors to the website are given a list of candidates in each category and asked to rate them as excellent, very good, good, fair and poor. Within each category, voters rate individual criteria. For example, for resorts, visitors assess food/dining, location, overall design, rooms, and service. The percentage of excellent and very good ratings is used to compile the “best” lists. San Miguel de Allende (one of Mexico’s 31 UNESCO World Heritage sites) is noted for its well preserved colonial center, as well as for its atmosphere, culture, artist community and shopping opportunities. It beat out Budapest and Florence which tied for second. Salzburg placed 4th while last year’s winner, Charleston, South Carolina, was tied for 5th with San Sebastian, Spain. Other North American cities in the top 25 were Quebec City (10th), Vancouver, BC (13th) and Victoria, BC with Santa Fe, NM which tied for 17th. Four of the top 25 cities were in Italy: Florence (2nd), Rome (8th), Sienna (9th) and Venice (24th). However, the only Mexican cities on the questionnaire were: Acapulco, Cancún, Ciudad Juárez, Cuernavaca, Guadalajara, Guanajuato, Mérida, Mexico City, Monterrey, Morelia, Oaxaca, Puebla, Puerto Vallarta, San Cristobal de las Casas, San Miguel de Allende, Tijuana, Veracruz and Zacatecas. Each of these cities was rated with respect to cultural/sites, friendliness, atmosphere/ambiance, restaurants, lodging, and shopping. Obviously, many other Mexican cities, such as Mazatlán, are far from happy at being excluded from the list of candidate cities. Other Condé Nast Traveler reader’s selections for Mexico included “top 15 hotels in Mexico”, “top 10 resorts in the Pacific Riviera, Mexico”, “top 10 resorts in Baja, Mexico”, and “top 30 resorts in Cancun and the Yucatan, Mexico”. Clearly, hotels and resorts that are not included in the Condé Nast candidate list for this popularity contest miss out on a great deal of free publicity. Are these the 101 most beautiful small towns in Mexico? 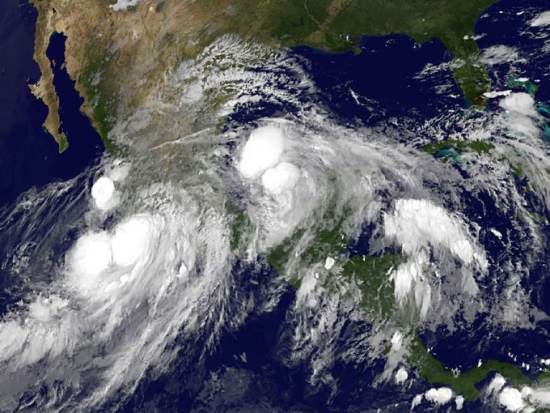 For the first time since 1958 Mexico was bashed virtually simultaneously by two very destructive storms: Ingrid in the east and Manuel in the west. Before discussing their destructive impact, we will describe the tracks of the two storms (photos below) and chart their chronology. On September 10, weak weather disturbances were observed in the Caribbean east of the Yucatan Peninsula and in the Pacific south of Chiapas. The disturbance in the Caribbean gained some strength before hitting land which weakened it. It survived its crossing of the peninsula and re-emerged in warm waters of the southern Gulf of Mexico where it quickly gained strength. By the afternoon of September 12th it was upgraded to an official tropical depression. Meanwhile the disturbance in Pacific moved slowly westward and by the morning of 13th was upgraded to a tropical depression. At about noon of the 13th both storms were upgraded to become named tropical storms (Ingrid and Manuel respectively) meaning they had winds of over 40 mph. In other words, the birth of “Ingrid” and “Manuel” were almost simultaneous (light green spots on the tracking maps). After earlier moving westward, both storms started to move north and slightly east picking up moisture, strength and wind speed over the warm ocean water. Ingrid continued to move north gaining strength and by the next afternoon, the 14th, it was upgraded to a Category I hurricane with winds of 75mph. It started to move west and winds increased to 85mph on the morning of the 15th. Meanwhile Manuel also started to move west again skirting the coast of Guerrero and Michoacán. Early on the 15th Manuel’s winds reached 70mph. Though wind speeds did not quite reach hurricane level at that time and the eye of Manuel never made landfall, it brought enormous amounts of rain to coastal communities. For example, on September 14th Chilpancingo, Guerrero’s capital, got 393mm (15.5”) of rain while Acapulco got 140mm (5.5”) (Wunderground.com). This, added to considerable rain on preceding and following days, led to horrific flooding. On September 15th Hurricane Ingrid with winds of 75-85mph drifted toward Taumalipas in northeast Mexico. Meanwhile. Tropical Storm Manuel with winds about 60mph made landfall near Manzanillo, Colima. Once over land, the storm quickly lost power; by that evening winds were down to 35mph and Manuel was downgraded to tropical depression, but heavy rainfall continued. The next morning on the 16th Manuel’s winds were down to 30mph and it was further downgraded to a “remnant” of a tropical storm. But later that day, the remnant of Manuel move back to the Pacific Ocean near Puerto Vallarta and began to regain its strength. That same morning September 16th Ingrid, which had weaken to a tropical storm with winds of 65mph made landfall just east of Ciudad Victoria, Tamaulipas. By the next morning, the 17th, Ingrid’s winds were down to 25mph and it was downgraded to a “remnant” though heavy rainfall continued. Later on the 17th, Manuel regained its status as a tropical depression (winds of 35mph). The next morning, the 18th, it regained tropical storm status and by that afternoon it became Hurricane Manuel with winds of 75mph. 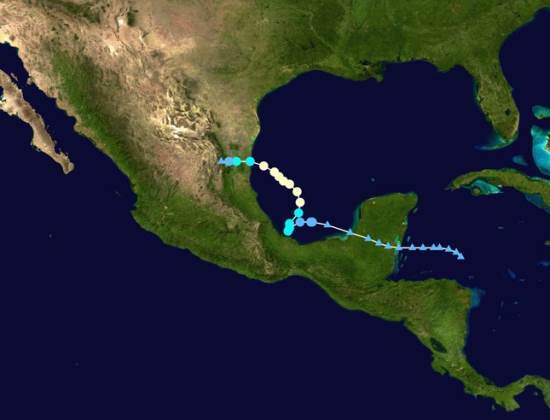 Early on the 19th it made landfall west of Culiacan, Sinaloa. Moving east over land Manuel quickly lost power and was down to a remnant by the morning of the 20th. However, the remnant of Manuel continued far north and east joining the remnant of Ingrid and bringing torrential rains and flooding to central Texas, including Austin. While storms are classified by their wind speeds from tropical depressions to tropical storms and then to hurricanes with intensities one up to five; this classification does not capture the extent of damage that can be caused. The amount of rain combined with the terrain can be far more damaging than the wind speeds. Furthermore the storm surge associated with a storm’s low pressure and high tides can be far more devastating than the winds as we saw with Hurricane Rita in New Orleans and Hurricane Sandy in New York. In the case of Manuel, the amount of rainfall was far more destructive than the winds. 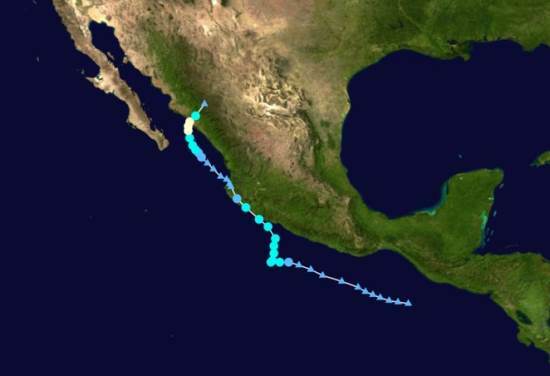 The rains of Manuel as a “tropical storm” off the coast of Guerrero did far more damage than Hurricane Manuel did later in the State of Sinaloa or Ingrid did in eastern Mexico. Manual caused a total of about 84 reported deaths. At least 72 people were reported dead in Guerrero and another 68 were reported missing in the town of La Pintada that was partially buried under a massive mudslide. In Acapulco about 18 died. Floods closed the exit highways and the airport, temporarily stranding 40,000 tourists. These photos from the Guardian and USAToday show the extent of flooding in Guerrero, especially around Acapulco. In contrast fewer than a dozen people reportedly died in Sinaloa which was later directly hit by Hurricane Manual. While Ingrid had considerably stronger winds than Manuel, its death toll of only about 23 was spread across several states from Puebla just east of Mexico City up to Tamualipas on the Texas border. More than half the total, 12 died in Altotonga, Veracruz, when a mudslide smashed into a bus. Of course, deaths are not the only, nor the best, measure of a storm’s destructive impact. Other commonly used measures are the financial cost of the damage and the number of people who evacuated or become homeless. No matter what measure is used, hurricanes are one of the most destructive natural hazards. Where do most Hispanics in the USA live? Other Comments Off on Where do most Hispanics in the USA live? A recent study by Pew Research analyzes the geographical distribution of the over 53 million Hispanics who currently live in the USA. The “Hispanic” or “Latino” population is composed of many different segments. It includes families that have lived in the USA for numerous generations as well as recent immigrants from many countries. Mexicans are by far the largest Hispanic origin group. There are 34.7 million Mexicans in the USA accounting for 64% of all Hispanics. A future post will look at the geographic distribution of Mexicans in the USA. Several previous posts, including “Recent trends for Mexicans living in the USA”, have investigated the socio-economic characteristics of Mexicans living in the USA. Though Hispanics are spreading throughout the country, they still tend to be concentrated in the west, particularly states that border Mexico [see map]. Almost half (46%) of Hispanics live in California (14.4 million) or Texas (9.8). Other states with relatively large Hispanic populations include Florida (3.5m), Illinois (2.1m) and Arizona (1.9m). Almost 47% of New Mexico’s population is Hispanic compared to 38% in both California and Texas. Fully 44% of Hispanics live in only 10 metropolitan areas. Almost half (46%) of the Greater Los Angeles population is Hispanic. The Los Angeles–Long Beach metro area has 5.8 million Hispanics and the neighboring Riverside–San Bernadino metro area has another 2.1 million, giving Greater Los Angeles 7.9 million Hispanics, 15% of the USA total. The New York–Northeastern New Jersey metropolitan area is next with 4.3 million Hispanics. Other metro areas with large Hispanic populations include Houston (2.1m), Chicago (2.0m), Dallas (1.8m), Miami (1.6m), San Francisco–San Jose (1.6), Phoenix (1.2m), San Antonio (1.1m) and San Diego (1.0m). Over 80% of the Greater Los Angeles Hispanic population is Mexican. Mexicans also dominate the Hispanic populations in Houston (78%), Chicago (79%), Dallas (85%) as well as most other metro areas in the USA. In metro New York, Puerto Ricans are most numerous among Hispanics (28%) followed by Dominicans (21%) and Mexicans (12%). Puerto Ricans are also most numerous in Orlando (51%), Tampa–St Petersburg (34%), Philadelphia (56%), Boston (29%) and Hartford (69%). Cubans dominate the Hispanic population in Miami (55%), Fort Lauderdale (21%) and West Palm Beach (21%). In metro Washington DC, Salvadorians are most numerous among Hispanics (32%). Roughly one third (36%) of all Hispanics in the USA are foreign-born; the rest were all born in the USA. Miami has the highest proportion of foreign-born Hispanics with 66%. No other metro area with over a million Hispanics has more than 43% foreign-born. On the other hand, only 17% of Hispanics in the San Antonio area are foreign-born with 83% born in the USA. 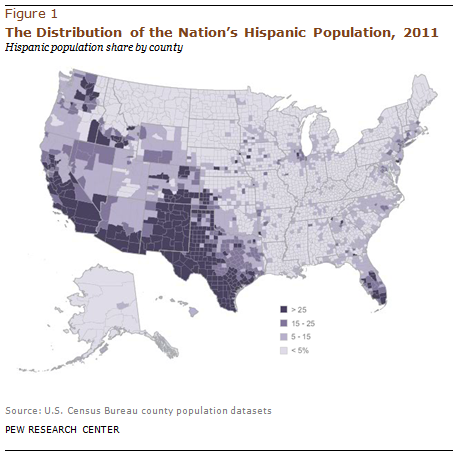 Pew Research, “Mapping the Latino population, by State, County and City”, 29 August 2013. As the US Congress debates new immigration reform legislation there is considerable confusion concerning the fiscal impact of immigrants. One side argues that immigrants pay relatively little in taxes and absorb costly benefits in terms of public health, education, welfare, etc. Others note that immigrants often pay significant amounts in taxes and get little back in terms of benefits. Obviously, it depends on the immigrant and perhaps on their legal status. 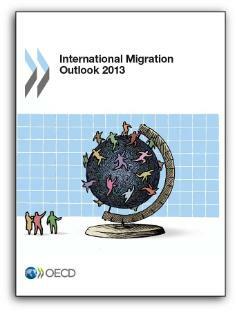 In June 2013, the OECD published “International Migration Outlook,” a study on the budgetary impacts of immigrants to OECD countries. (OECD countries Mexico and 29 other mostly rich and mainly European countries). The study compares native-born with foreign-born residents, some of whom may have already become citizens. The study suggests that immigrants may have a slightly positive impact on fiscal budgets. The average for all OECD countries was 0.3% of GDP; the comparable figure for the USA was 0.03%. Immigrants tend to have lower incomes, pay a bit less in taxes, but receive less in benefits. They tend to be younger and thus receive less in public health benefits. If they have children, they receive considerable education benefits. Obviously these are gross generalizations as some immigrants are highly paid executives and scientists, who pay significant taxes, while others may work as domestics or laborers, paying far less in taxes. Given that many public costs, including defense and debt service, are very hard to allocate to migrants versus native-born, the study suggests that immigration appears to be neither a drain nor a gain on fiscal budgets. A big issue in the USA is the specific impact of Mexican immigrants on the fiscal budget, particularly the impacts of undocumented immigrants. Many legal immigrants from Mexico are family members joining their relatives. They may or may not be employed and thus may not pay income taxes. On the other hand, virtually all illegal immigrants seek employment. Furthermore, many obtain formal sector jobs by using fake Social Security cards or “Individual Tax Identification Numbers.” Their employers deduct federal and state income tax from their paychecks and forward these funds to government tax agencies. Undocumented immigrants rarely file tax returns and thus very rarely receive the tax refunds to which they might otherwise be entitled. All immigrants pay considerable amounts in gasoline and sales taxes as well as property taxes, either directly or indirectly as part of their rent. Given that most illegal immigrants are rather young, relatively healthy and without children, they may have only a small impact on public education and health expenses. Their children are often born in the US, are US citizens, and should not be considered immigrants. It appears that undocumented immigrants might be paying more into the public coffers than they receive in benefits. A closer look at the data may provide some answers. A 2007 study by the US Congressional Budget Office (CBO) entitled “The Impact of Unauthorized Immigrants on the Budgets of State and Local Governments” directly addressed this issue. The study notes that at the Federal level roughly 50% of illegal immigrants pay income or payroll taxes, which include Medicare taxes. But they generally are excluded from such Federal benefits as Social Security pensions, Medicare and Medicaid (other than emergency services), Food Stamps, and Assistance to Needy Families. The data suggest that in general illegal immigrants usually pay more in federal taxes than they receive in benefits. On the other hand, a number of court cases mandate that state and local governments cannot withhold from illegal immigrants certain services such as education, selected health care, or law enforcement. Many illegal immigrant children do not speak English; therefore their education may be more costly. In assessing the fiscal impact on state and local government budget, the CBO analyzed 29 reports published since 1990. The study noted that undertaking such an analysis is very challenging and involves many big assumptions. Still the CBO analysis concluded that the relatively small amount spent by state and local governments on services for illegal immigrants is not fully offset by the even smaller amount of tax revenues collected from them including federal revenues they may receive for this purpose. In conclusion, available research suggests that the impact of immigrants on public budgets is not very clear. With respect to all immigrants, there appears to a slight positive fiscal impact according to a recent OECD study. The older CBO analysis indicates that undocumented immigrants appear to have a positive impact of the federal budget, but a negative fiscal impact for state and local governments. Of course, the impact varies enormously among migrants depending on their incomes, tax brackets, consumption patterns and needs.